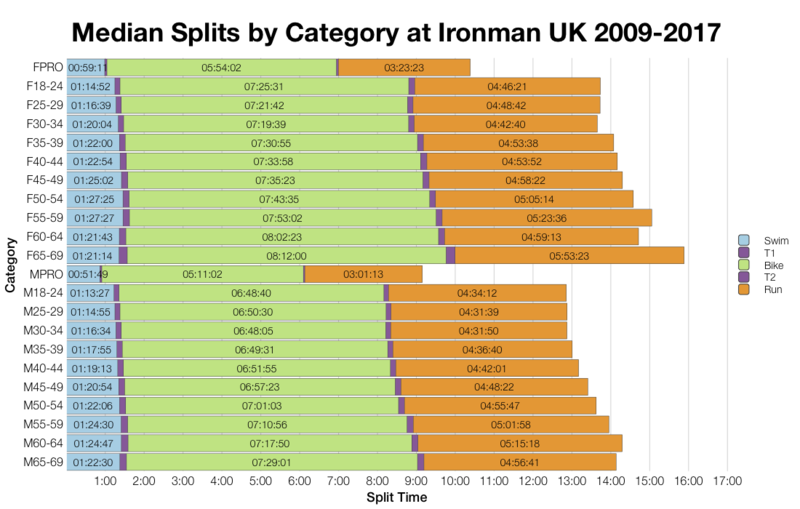 This week’s race analysis is for Ironman UK. The Bolton event took place on Sunday with a field in excess of 1,800 athletes competing for 40 Kona age group slots. Moorland fires in the region forced adjustments to this year’s course – the race went ahead with a reduced bike of 95 miles. That obviously has a huge impact on results as we’ll see in this analysis. A slower trending swim and run are easily outweighed by a vastly faster bike at this year’s race. 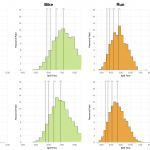 This shows in the first chart: this year’s median age group bike split is comparable with the fifth percentile from the previous 9 years. 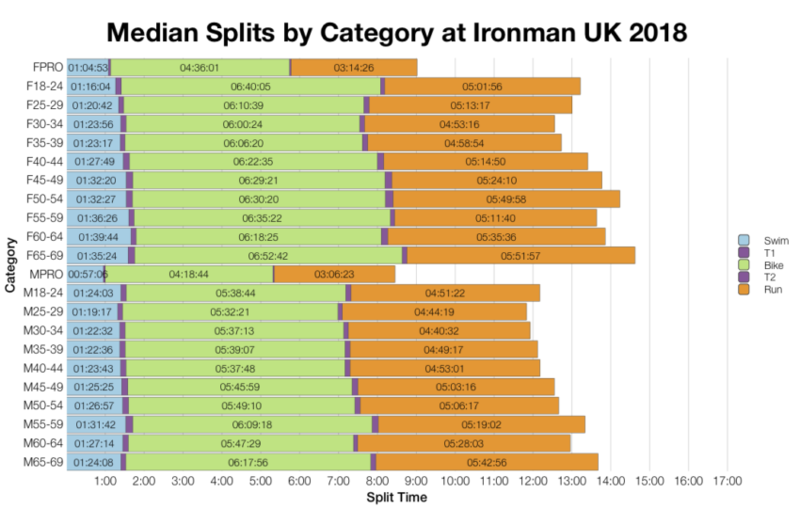 The run looks to have been impacted by the warm conditions the race experienced, but the hit to time there puts a minimal dent in the overall splits. As I did with Frankfurt’s long bike course I’ve applied a simple transformation to the bike and overall splits for the second chart above. 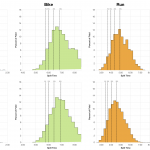 Assuming athletes would sustain their pace over the missing 17 miles of the bike course, the charts show how the distributions would look. Had the bike course been 112 miles then we’d potentially be looking at a slower race all round. It should be noted that this is a very simplistic way to deal with the course changes. We’d expect an additional 17 miles would have a broader impact on the pace most athletes sustained in both bike and run. 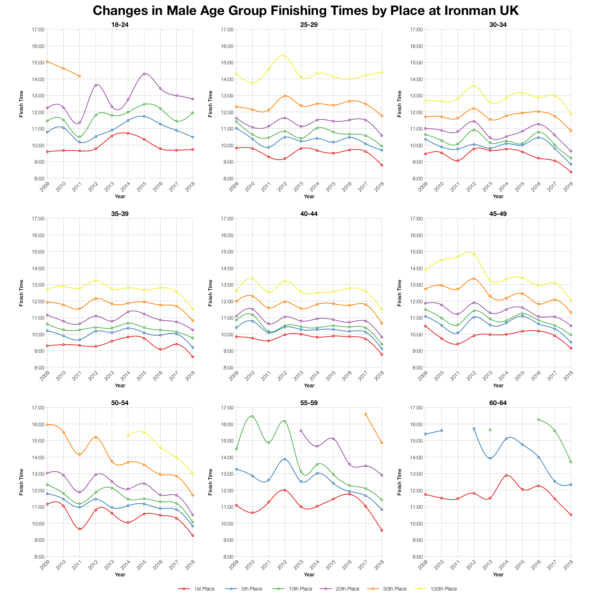 It’s also worth considering how, over the years, the Bolton course has changed a number of times meaning the amalgamated data for the previous 9 races is an imperfect guide to the current course. Still, in hot conditions, I don’t think it’s unreasonable to say this was a slower year at Bolton save for the shortened course. The reduction to the course length also helped reduce the DNF rates for the race. 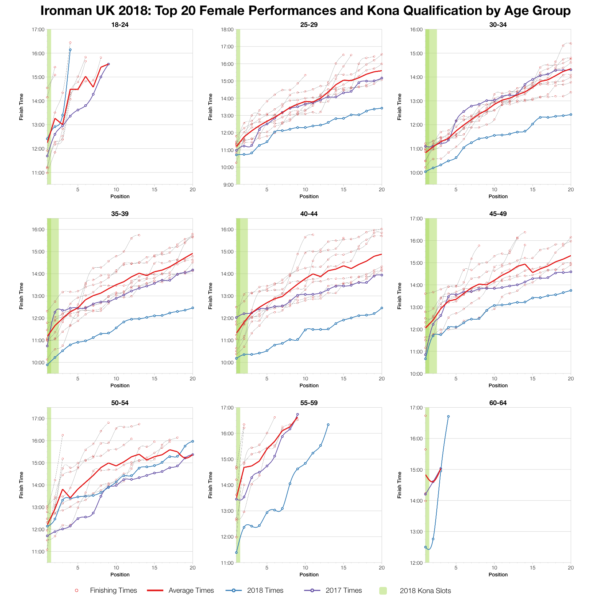 As every I’ll note that the presentation of results in previous years has often mixed DNS and DNF numbers inflating swim and overall totals. 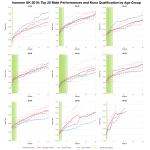 What we can clearly see though is the lowest DNF rate for the bike course and a mid ranged DNF rate for the run course. This probably reflects the fact it was easier to complete within the cut-off times than in previous years. We’ll pass quickly over the medians. Of course the bike was faster for all age groups. The run and swim were generally slower. 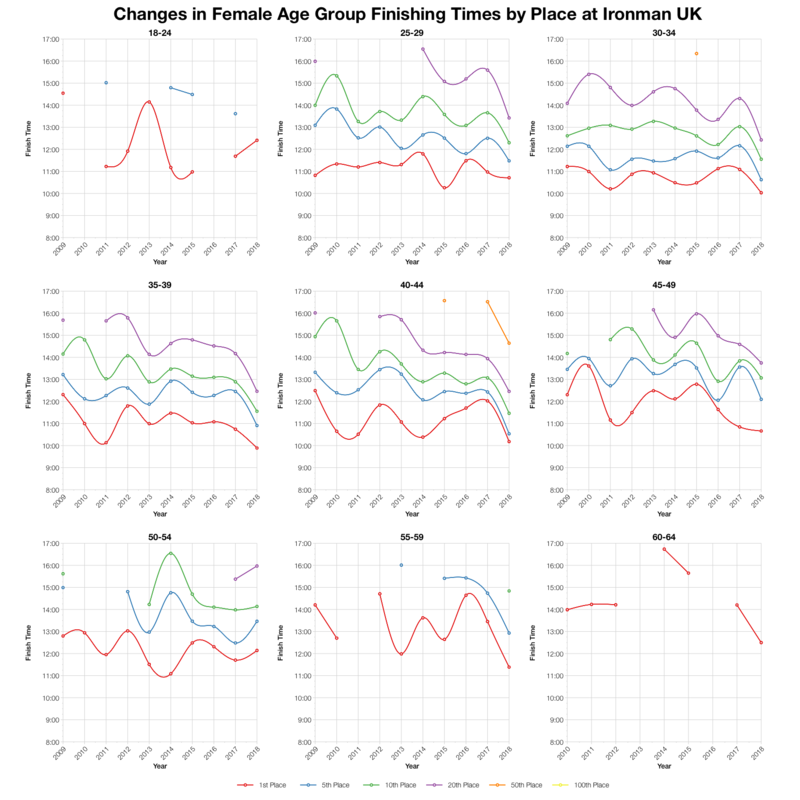 Ironman UK was predominantly a UK event with a small number of athletes coming from further afield (Ireland unsurprisingly being the next biggest). Slots tended to stay in the UK, but a third went elsewhere. 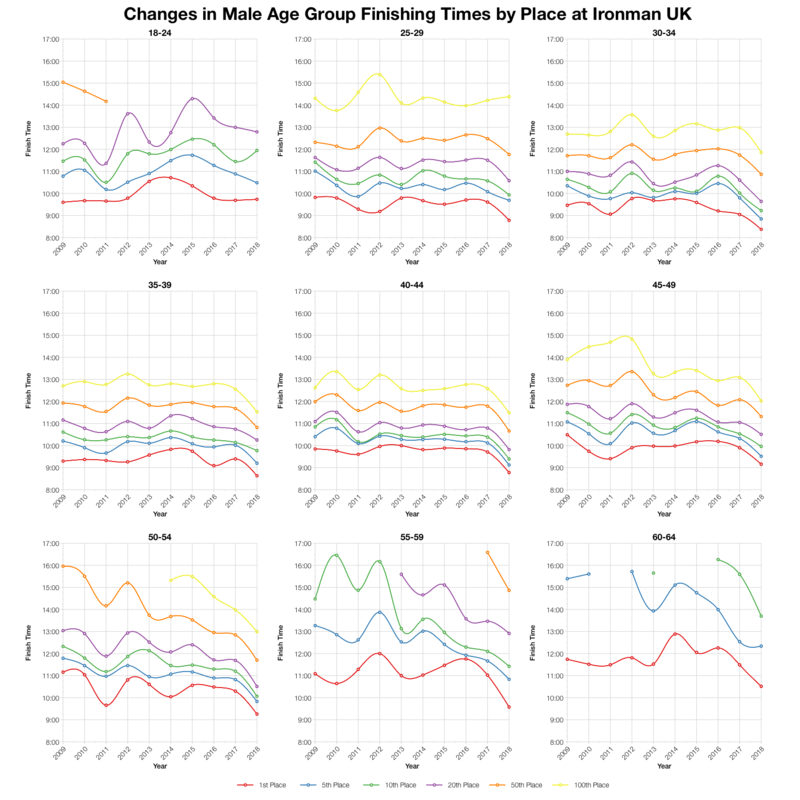 For the largest age groups the course has actually been quite consistent since 2013. Most of the course changes happened in the years prior to that. 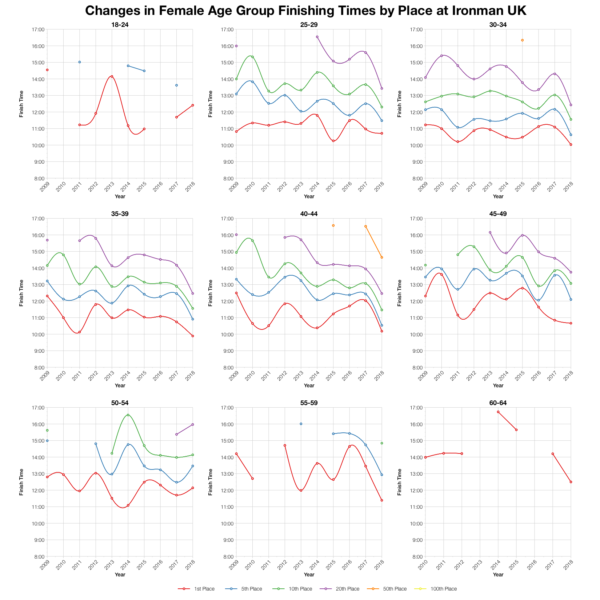 Obviously we see a very consistent drop in times for this year’s race. Based on the start numbers I’ve estimated the slot allocation and the automatic qualifying times for those slots. Exact numbers will vary and roll down would affect the final qualifier. 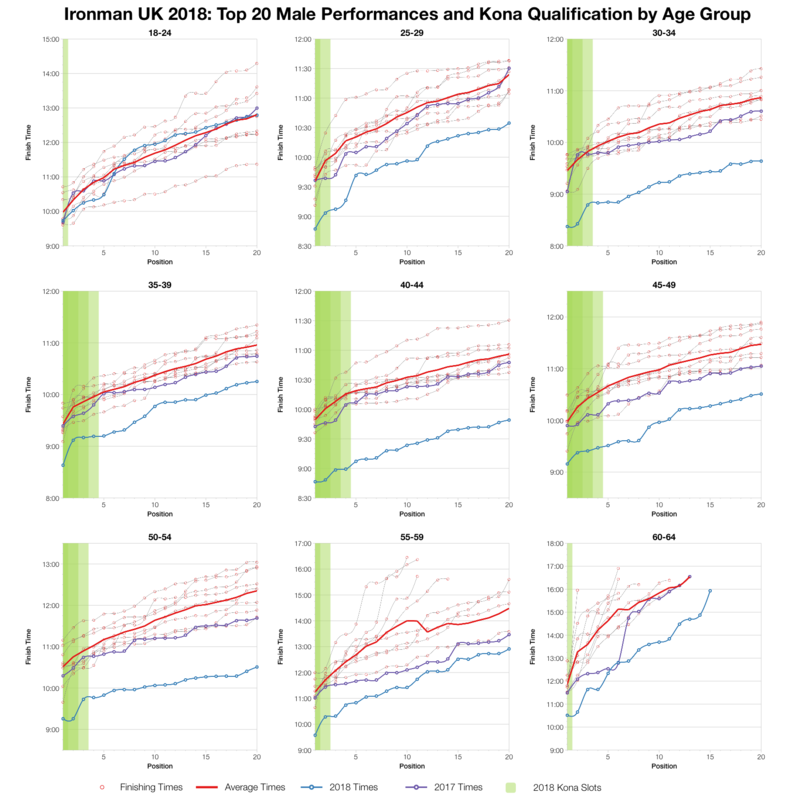 You can compare this with other races on my Kona qualification page, just remember this was much faster than usual for Bolton. 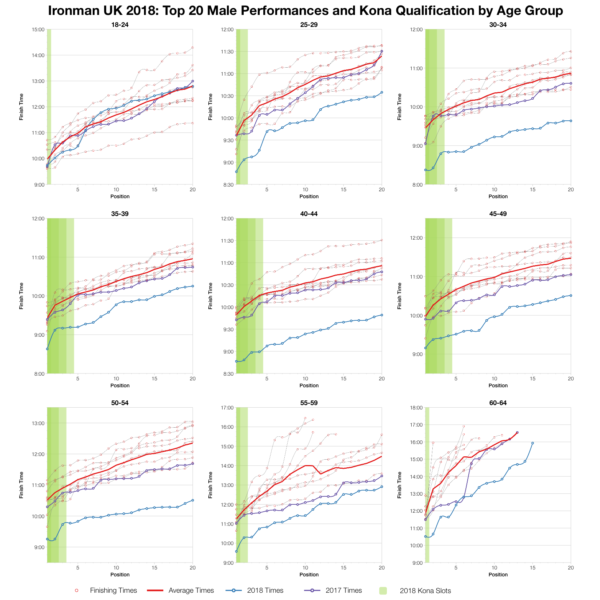 The pattern is quite clear for the top twenty in each age group. Much faster than normal by about the time needed to ride 17 miles on a bike. 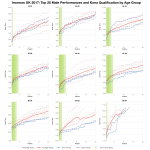 The under 25s don’t appear to have performed quite as well – their graphs trend close to the averages. Otherwise we see a race we can’t really compare with previous editions of this event. You can access a spreadsheet of the full results from Ironman UK 2018 on my Google Drive.